XIM4 is no longer in production. Our new product XIM APEX will be released in Q1 2018. All orders will ship within 1-2 business days. International prices do not include customs/VAT charges. XIM4 provides the highest precision mouse and keyboard (and more) experience on Xbox One, PlayStation 4, Xbox 360, and PlayStation 3. Unsurpassed quality, ease-of-use, and flexibility, XIM4 is the perfect companion to the even most demanding gamer. XIM4 empowers gamers with the state-of-the-art without bombarding them with unneeded complexity. Through XIM's unique Smart Translator technology, XIM4 is able to provide unparalleled 1-to-1 gaming precision that consistently performs in every game you play. It's quick and easy to set up your preferred gaming environment through it's wireless smartphone and PC configuration tool. 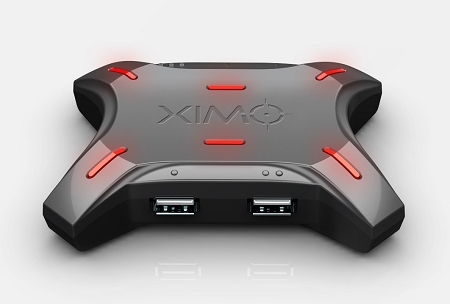 XIM4 enables gamers to choose their preferred input devices that suit them best whether gaming at a desk or from a couch in the living room. !!! IMPORTANT XIM4 used on Xbox One Slim or PlayStation 4 Slim/Pro requires a firmware upgrade prior to use. !!! XIM4 Manager configuration app requires iOS 8 or higher devices (iPhone 4s and iPad 3rd-gen and above) (important instructions for iOS users) or Android 2.3.3 or higher (important instructions for Android users) or a PC running Windows 7/8/8.1/10 x86/x64 with Bluetooth v2.1 capability (important instructions for PC users). XIM4 firmware updates require a PC running Windows 7/8/8.1/10 x86/x64 or a Mac running OSX 10.11 or higher. Using XIM4 with Xbox One requires an extra micro-USB cable to connect the controller to XIM4 (not included). Using XIM4 with Xbox 360 requires a licensed Xbox 360 wired controller (not included).